All screenshots is clickable. Click to enlarge. If no create new document on start of Aml Pages, You will be see empty main window. The window contains list of last used documents of Aml Pages. Uncheck option "Create a new blank document at startup". Pinned tabs of documents is visible always. Click on tab and will be open document. Right click on tab of this document. Choose menu command "Pin Tab". If command "Pin Tab" is checked, then the document tab already is pinned. Right click on caption of main window. The popup menu contains list of last used files. 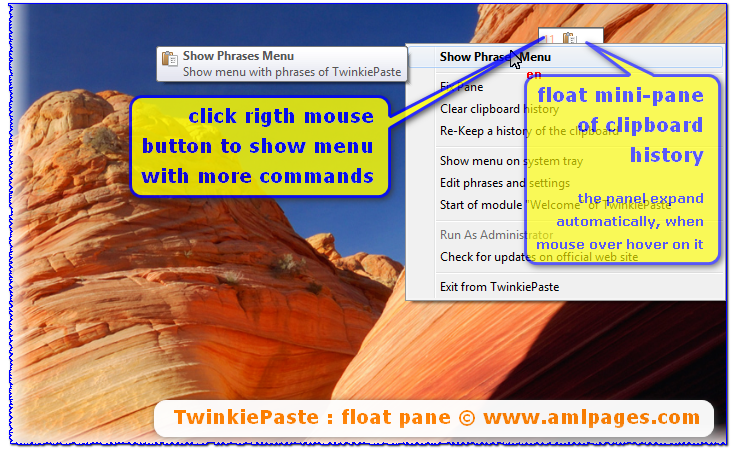 Also You may to open documents from popup menu by right click on Aml Assist pane. The plugin FavEx implements of extension of Favorites menu. The plugin save to this menu: links to last changed nodes of Your documents and links to nodes, added by user manually. Click on this menu items — Aml Pages will be open document (if required) and will be navigate to node. This plugin already has beed included into Aml Pages installer.